Matchday snaps for M1s, M2s, M6s & GD here. Despite winning the previous week, the first team knew that they would have to be much sharper against this week’s opponents, Bedford. The opposition were flying several points clear at the top of the league having won the vast majority of their games. The Dragons were confident however, that a win was possible and that a disciplined performance was all that was needed. The ladies started strongly, the Norwich defence controlling play. Lou Murray saw that any opposition breaks were dealt with swiftly and alongside Olivia Thomas, dominated play down the right hand side of the pitch. Holly Limmer looked strong on the left and Sarah Jenkins at the back marshalled the defence and was frequently the starting point for excellent passages of play. The teams seemed very evenly matched throughout the first half and it was only when a mix up led to a Bedford penalty corner that the Dragons started to feel the pressure. A slickly taken corner, straight off the training ground, resulted in Bedford taking the lead 20 minutes in. Dragons fought back hard though, still very much in the game. Marie James found some space in the centre of the field and passed to the powerhouse that is Hannah Phillips. Phillips drove to the top of the D and found Stacey Lee waiting. Lee turned and ran her trademark hazy run at the keeper and then slotted it neatly in the back of the net. The score was 1-1 going in to half time. Half time gave the opposition time to regroup and they came out fighting. Wave after wave of attack faced our defence, but the ladies stayed strong. Holly Reding looked unbeatable, time and again stealing the ball from the opposition with her excellent timing and on the occasions when the ball did make it through the defence, Siobhan Cleeve was there in full voice, controlling proceedings and dominating her area. Several outstanding saves kept the Dragons in the game. With Aoife Lowe-Davies and Tabba Tabrett looking dangerous on the break, the Dragons fought as hard as they have all season. At the final whistle the score was 1-1; a well-deserved point earned by the discipline and determination of the Ladies 1sts. Dragons arrived at Wilberforce Road with a squad of 13, a luxury given last weeks bare 11. With Ally Windsor-Waite fighting fit again and with Sophie Thomas added to the ranks, the team were keen to continue their positive run of form. With the young University Team having had some improved results more recently, Dragons knew this was going to be a tough game, especially given the home team had strength in numbers. The match started evenly with both teams having decent spells of possession, but neither side making any real progress into their respective attacking D’s. 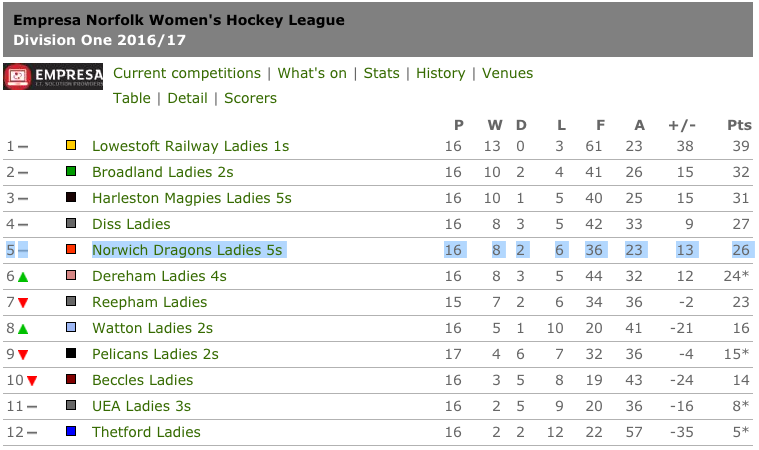 The Dragons defensive line was once again looking strong and in control, with Sarah Borrett, Rowie York-Smith, Ally Windsor Waite and Karen O’Neill Simpson all going about their jobs, protected by the ever dominant Donna Vaughan. In attack, Dragons forwards Issy Wolfe and Hannah Hardy were at times a little isolated, despite Issy Wolfe making some strong attacking runs, however the team were never quite able to turn their pressure into real goal threatening opportunities. The midfield were as always needing to work hard, with Gail Thomas, Shelly Seaman, Helen Busfield, Sophie Thomas and Kiera Goymour all putting in a lot of hard miles up and down the flanks. Dragons reshuffled things a little at half-time, which had the desired effect in ensuring we were tighter defensively, as the Cambridge University teams larger squad and younger legs meant they were slightly the sharper team at times. Donna Vaughan was outstanding in the heart of the Dragons defence, deservedly picking up Player of the Match. Dragons forward Issy Wolfe managed to earn the only short corner of the whole game, which was fired marginally wide by Vaughan. With the clock winding down, the students had one final foray into the Dragons D, and for a heart stopping moment, there was a one on one situation with Dragons keeper Emma Cleland, however the ever reliable Cleland kicked the ball wide to safety and the danger was gone. Not Dragons most fluent performance, but a point on the road against a strong squad was better than no points. Lots of work still to do, starting next week against Lowestoft who had a fine win against Dereham. 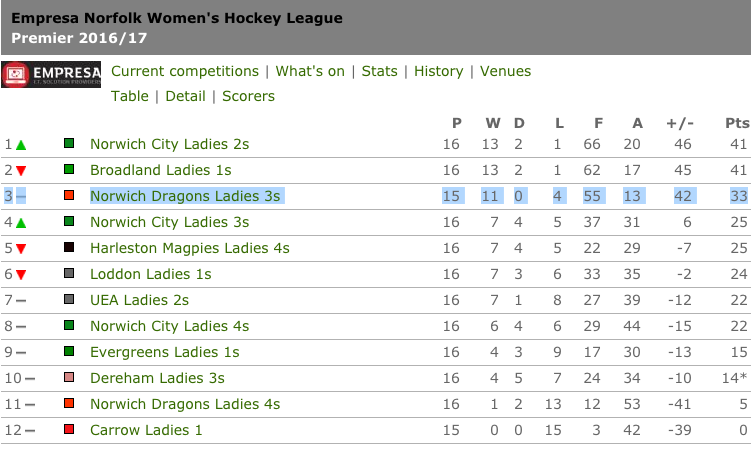 Ladies 3s lost 2-1 to Broadland ladies. Fantastic performance all round ladies! Couldn’t be more proud to play hockey with these girls. Player of the match, the face of the team, chuckle brother Debs Smith. Goal from Sian Lawrie. Well battled ladies Haz we hope your head isn’t too painful in the morning. Broadland were residing at 2nd place in the table and had previously beaten us 3-2 in a very close battling game. So our mission statement was ‘come out fighting’. Fiona Fletcher had first push back, passed to Lynne Price, out wide to Karenza Moffatt who with her usual speed and skill passed by the opposition bringing the ball up to the D. Swept across to Lynne waiting at top of the D and then into Aditi Naik moving dangerously inside the D, slotted the ball into goal and catching a foot on the way. First short corner injection from Fiona to Lynne, right pass to Vicky Earley shot into goal but deflected by keeper, Vicky hooks the ball back again and goes for another shot, denied again. Broadland defence were feeling the pressure. In the first 5 minutes Dragons won 3 short corners but were unable to convert, on the third Lucy Buxton went in hard to pick up the ball in the D but caught a blow to the knuckle making her finger look like a sausage! At least the ball was kept close to the opposition goal! Broadland tested our defence with some cracking shots right down the pitch where they had some goal hangers waiting. Amelia Smith who was feeling poorly but had to man up and be the central defender had a great game, reading the play and picking up those long balls. Working well with Katie Franks, Rachael Matthews and a late call up to Helen Marsh. With Lucy out to injury players jiggled around with Mel Widdows working the wings and playing the ball up to Catherine Matthews, who kept finding space in the left corner. Bringing the ball into the D and firing a shot off, deflected and picked up by Fiona, another deflection, Catherine this time popping off a lovely reverse hit which the keeper dived for and the ball cracked off her helmet. The keeper making some great saves, the Dragons were building pressure and a goal final came, from a pass out wide from Lynne to Catherine into the keeper, deflection picked up by Lisa Harwood who reverse flicked it over the keeper and into the backboard! The midfield were working hard to keep feeding the ball up to the forwards, even Katie and Helen were pushing high to move the ball forward, cutting off progress from the opposition, who were finding it difficult to get round us. At half time we felt energised, we were moving the ball round the pitch, attacking like the force! Broadland were going to come out hard for the second half, so we had to keep up the pressure right till the end. Broadland were still trying to get those cracking shots through us, one finding the tibial tuberosity of Karenza, who limped off the pitch, luckily she had put in excellent effort in the first half so she was allowed a rest. Rachael stepped into midfield, gameface on and gave her usual tireless effort and pace. The second half was a repeat of the first with lots of pressure on the opposition D. Another scrabble in the D with a ball being fired in from Lynne, Fiona trying another shot, keeper flying around, Lisa picked up the ball and pushed it along side the keeper into goal. Whoop 2-0. Luisa Valentini our keeper was enjoying the view and calling out to watch those Broadland players trying to make a move. Aditi was picking up fast balls from Lynne up the right wing and was providing support into the D. The final goal was like watching rounders, ball passed across the D from Lisa, deflected upwards from the opposition stick and batted into goal by Lynne. After all this glory we were ready for a cup of tea. The 5’s played their best game today all working excellently as a team, supporting each other and playing hard from the start to the finish. Player of the match was Lynne whose positioning is great and always a step ahead of the opposition. Score 3-0. It was obvious early on the Dragons were dominating the possession and Breckland were planning to break on the counter attack with one player who held their midfield. She, however, was no contest for our Duracell Bunny Sue Brumby who matched her step for step, frustrating her with her self pass runs through the centre of the pitch. Dragons were caught off-guard and unlucky to concede a goal in the first half completely against the run of play. After a good second half team talk & a new found coach in Anita Mancini who came off injured in the first half, Dragons were ready to press. Amy Forse left her defensive position to push forward and build the attack. Nic ROBINSON, Hannah Woods and POM Ginny Simkin held the back line. With some fantastic ball distribution from Ginny out towards Rosie Skipp, Beth Elgood and an every active Sue Brumby. Kat Speirs was really called into action, but when needed she used some deft stick and pad skills to clear the ball fast and wide into the paths of waiting player ready to press the attack again. With Breckland packing their defence, this gave our mids room to play some fantastic hockey working the ball around the width of the pitch. However, it also made it difficult to get into the D. However, after some glorious passing up the right between Beth Elgood, Sue Brumby & Mia McGhee, Hannah Edwards found herself tight to the back line with seemingly no where to go. With a swift turn she fired a sublime pass across the face of goal touched passed the near post by Ellie Hipper into the path of a waiting Lilly Sore who slotted it behind the keeper with precision. This fantastic move completely deserved by the Dragons who had spent their warm up practicing post deflections. The second half for Dragons was a spectacular display of both individual skill and amazing team work. We moved as a unit, supporting each other all the way up the pitch. Dragons 7s faced second in the league Hornets, who were expected to be formidable opponents, but Dragons were undaunted and relished the challenge. Hornets won the toss and chose to take the first push back. Both teams fought hard, with the ball going end to end. Dragons played with their usual great passing, with Maisie Dearmer and Jess Vernon linking up to make a great team on the right. The ball was passed across with Kelly Mills, Jemima Dorman and Claire Stuart ready to receive and push into the D. After some scuffles, the ball rolled across the line, giving Kelly her first goal of the match. Dragons were pleased to be ahead, maintaining the good play. Ruby Rose-Turrell again proved that bottom of the diamond is a good position for her, darting about to distribute the ball and tackling Hornets to stop them. Stevie Spencer on the left also had a great game, making good interceptions and passes. Esme McKinnon-Evans yet again proved to be a versatile player, being put in several different positions throughout the game and accepting each one with no qualms and playing well wherever. The defence of Frankie Paul, Emma North, Katy Saide and Hattie Gale were fearless when faced with Hornets big hits, aiding keeper Luisa Valentini and getting the ball up the pitch. Dragons had obviously been paying attention at training, using the width, passing before reaching danger and ready to stop the Hornets 16 yard hit outs. Dragons determination paid off, with another goal, this time by Jemima. Dragons kept pressing and it wasn’t long before they were rewarded with a third goal, Jemima’s second. Hornets constantly put on the pressure, keen to score making Luisa stop a volley of hits, with the ball finally getting knocked out of the way and up the pitch. The second half got underway with the same spirit as the first. Dragons piled on the pressure but Hornets were not making it easy. However, both Jemima and Kelly managed to get the ball into the back of the goal. Hornets persistence was paid off and they pulled one back. That was all they could manage to get past Dragons defence. The final result being 5:1 to Dragons. Dragons were elated with the result, with Captain Claire Fairhurst pleased with everyone’s performance, a great team effort by all without exception. This was a very disappointing result for Dragons against a team who had not previously won a game all season. Discussions went on long after the match as the Dragons analysed what can be learned from the game. The 8s took the risk of playing without a goalkeeper, since no-one in the team felt able to put the kit on without a prior practice. But the move did not come off. Jo Baker nobly took on the duties of kicking back and duly earned the player of the match vote for a courageous display and loads of stops. Unfortunately, pulling Jo further back disrupted the defence, who were not their usual solid selves. Captain Katy Cole and Tactician Jo had to make more positional changes to accommodate some different players. They made every effort to give players equal pitch time and to make the best use of the players available. It just did not work out, and perhaps as a squad we do not have the game knowledge to be as flexible as was required. Praise for Lois Metcalf for switching from forward to defence and getting in some telling tackles. Tracy Stuart-Sheppard was available on a rare occasion and made her presence felt with strong blocking and determined running..
Dragons started brightly, when towards the end of the first quarter Bridget Le Good stopped a loose hit out and ran straight into the circle and shot past the keeper into the far corner. But any thoughts that they could build on this lead were quickly dispelled when City redoubled their efforts, clearly encouraged that there was no keeper. They hunted as a pack, chasing everything in the middle of the park and being first to the ball. City scored their three goals before half time, with the third coming with five unmarked players lining up to whack the ball past poor Jo. Dragons’ passing game was not up to its usual standard, despite the drills at Wednesday night training. However, they did play better in the second half. Louise Brooksy Brooks, Gemma Ballard and Bridget were up on the pace and began to ping the ball around and dominate midfield with Amelia Keightley-Web, who had an excellent second half on the right. What the Dragons lacked was a player to link with the energetic mids, despite Katy’s efforts in making herself available. Several times she and Shaniece Claxton drew players away and created space. Sophie Drew, an improving player, continues to get in some good runs on the left. But Dragons play was too disjointed. They lacked a final pass into the circle to get serious shots away and they lapsed back into their bad old habit of failing to get a player onto the near post to sweep in some excellent crosses from the right. Norwich Dragons Men’s 1st team had a very early start away to Cambridge University 3s. The game got off to a steady start with Dragons enjoying large portions of the possession, from which they created a couple of early chances that unfortunately did not lead to the opening goal. As Cambridge began to settle into the game, they too created the odd chance to take the lead but were unable to capitalise. Dragons defended well against a side that were obviously looking to attack the baseline and pull the ball back for a tap-in or a penalty corner. Eventually the deadlock was broken by Dragons after an attack down the left wing. Jonty managed to find Rupert, with both players having to cleverly persist and ride through several last ditch tackles, who then drove into the Cambridge D and found Olly King to slot the ball away. However, in a very similar fashion to the first time these two teams played each other earlier in the season, Dragons could not hang on to their half-time lead and were thoroughly outplayed in the second half. The consistent movement, slick passing and fitness of the 16 man university side took its toll on the 13 man Dragons squad, and as Dragons began to tire several uncharacteristic mistakes began to creep into their play. The ball was being turned over more and more, and Cambridge soon drew level after one such instance lead to a quick and clinical counter attack. After holding out for a bit longer Dragons then conceded two more goals in quick succession; one coming from poor marking allowing a back post tap-in, and the other from the very bizarre situation where a driven cross rebounded straight off the post to a Cambridge attacker for a simple reverse sweep. After going two goals down Dragons had nothing to lose and started to push more men forward, creating a couple of good chances towards the end of the match but were unable to finish any of these off. The final score ended Cambridge University 3s 3-1 Norwich Dragons 1s. A disappointing result but no doubt Dragons will work hard and be determined to bounce back next week against Cambridge City. Dragons welcomed their local rivals to the Den, hoping to overcome last week’s disappointing result. The home side were also boosted by the inclusion of Pebble after some recent off the pitch misdemeanours. The home side, mixed with youth and experience, started off the brightest. A trademark blast from Alex Brown finished off an excellent move to give Dragons an early lead. Charlie Nunn should have doubled the lead with a sublime upright reverse effort but it was unfortunately disallowed. Alex Brown was unlucky not to have added to his tally in a move that included him bringing down an aerial in the D and half volleying it towards goal on the reverse, only for the goalie to pull off an unbelievable save. Dragons entered half time one goal to the good, with Giles hardly tested. Jase congratulated the team on what was probably our best performance of the season so far and urged for more of the same. The second half followed the same blueprint as the first, with Dragons controlling the tempo of the game. Despite having numerous chances in the second half to extend their lead, none of them were converted. With the lead only a goal, City were never out the game. A well worked short corner from City led to a super save from Giles, but this was unfortunately put onto a dragon’s foot and dribbled over the line to draw City level. An even more determined dragons side attacked with numbers, pushing for that elusive winner. Shot after shot rained down on the City keeper and with minutes left on the clock it seemed like it might be one of those days. However, when Wilkins picked up the ball from a City clearance, he drilled the ball towards the goal where the deft touch of Richard Gill put the ball between his legs and into the bottom corner of the City goal, sending the capacity crowd into a frenzy! A fantastic performance from Dragons and a result they deserved. Man of the match was George Bowman for his tireless running in midfield, both disrupting City’s attacks and creating opportunities through the middle for Dragons. Dragons made hard work for themselves during the first half. Bury pressed high and were ringing up well, making it difficult for Dragons to get the ball out from their defence. Midway through the first half, Dragons were awarded a couple of short corners, from one of which Tom VAUGHAN drilled the ball towards the goal, only for a Bury defender to stop the ball on the line with his foot. Adam SAYER sent the keeper the other way to calmly slot home the penalty flick, putting Dragons in the lead. Dragons now seemed to get into the game and started to link up well, making some good passes amongst themselves. This was offset by being reduced to 9 players through not retreating 5, but Dragons managed to weather the flurry of Bury attacks, and a few short corners, which were expertly saved by keeper Ben NKRUMAH. The second half saw Dragons find their groove and they passed the ball around well. Continued hard work was rewarded with another goal when forward Aaron CURTIS took a free hit outside the D, dribbled the ball to the edge and played a lovely reverse stick shot which found the target. Good work in the middle from Lloyd SAYER, Rob GOODSON and man of the match Jack O’ MEARA, kept the attacks flowing for Dragons, who came close to extending their lead a few times, with L SAYER hitting the post. Another goal did come, and it was from leading Golden Stick contender Tom Vaughan. This sealed the victory for Dragons. Once again the defensive unit of Adam SAYER, Stu KELLY, James GOODSON and Joel DENNIS worked a treat and complemented each other well. There was also a good work rate from Will MAIN, John IVES and Jon GOODSON, who caused problems for Bury on the wings. 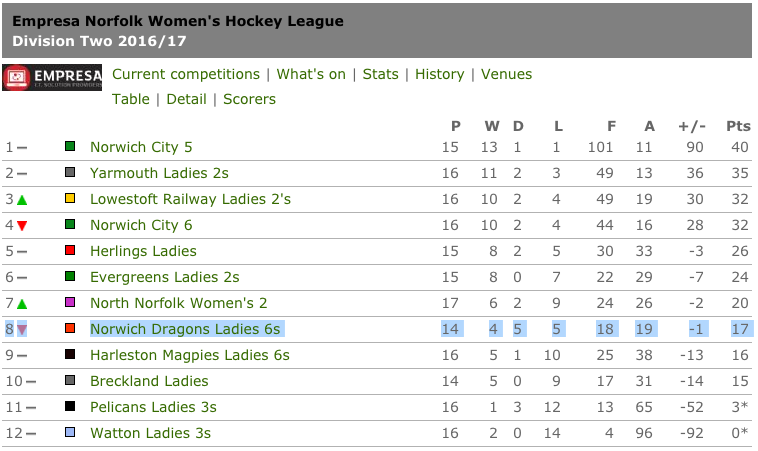 Dragons remain second in the table, and face Felixstowe 2s next week at the Den, in what will surely be an exciting game. The Dragons lined up for their first home of the new year against the League leading students from UEA. The trepidation before the start the game was proved justified within five minutes as UEA dominated and scored in quick succession. They continued to pile on the pressure leaving Dragons on the back foot and despite strong defending they added a second on the quarter hour mark. This galvanised the Dragons who began to come back into the game winning several short corners. These weren’t converted but the continued pressure eventually led to Pedro Goss be fouled in the D. Peter Davison stepped up to convert the flick superbly into top corner. Again, Dragons attacked the students goal, but in a breakaway UEA sprinted down the pitch with their final goal-bound hit striking Neil Shorten rather than his stick. The converted flick was the last action of note before the half. The second half started the way the first half ended, a quick UEA break leading the fourth goal. The half played just as the first with many attacks for both teams but the ruthless speed and clinical finishing of the students became the deciding factor. Two more goals before the end for UEA finished the result, but doesn’t reflect the energy and effort from the Dragons. Dragons played to the very end, heads didn’t drop but there will be many aching bodies on Sunday morning. Man of the match for the second week running was Peter Davison. A convincing 7-0 win, goals from Max Laming x3, Josh Bingham x2, Andrew Cross x1, Jordan Hambling x1, player of the match was Joel Lawrence. Norfolk Nomads 2 were the opposition for this week’s match. Never ones to be underestimated, their combined age didn’t stop them being another tough opposition for a Dragons 6 team that was playing well but still working on converting draws into wins. The first 10 minutes of the game very much set the scene for the way the whole game was played. It was never the most beautiful hockey ever seen at the Den, but it was a tight match that revolved around the midfield, with possession and accurate passing the key to either team making the breakthrough. Dragons 6 were the first on the score sheet with a great goal from Rob Lee assisted by Andy Key and Sol Blazer. The ball was worked though into Nomads circle and put away cleanly. From this, the game continued very much as before with effort and commitment being shown from both sides. Sometimes a little too much but always with the best intentions. As the half progressed Nomads pulled a goal back to 1-1, closely followed by another goal for the Dragon 6 scored by Sol Blazer. This was again the result of good play and effort from the midfield with Andy Key, Darryl Robinson, Tommy Chapman and John Butler all getting involved in the move that resulted in the ball in the back of the net. Norwich Dragons 6 2-1 Norfolk Nomads 2. Unfortunately, Dragons were unable to capitalise on the lead and stretch further ahead. What did happen was that for a short period, Dragons lost the run of play in midfield which allowed Nomads to score two goals in relatively quick succession. This did have the effect of taking the wind out of the Dragons sails for a short while but they had regained composure by the time the half time whistle came. Half time: Norwich Dragons 6 2 -3 Norfolk Nomads 2. The goal that tied the match proved this perfectly. The ball went out of play deep into the Dragons half on the left hand side of the pitch. Graham Muff took the push in with a long cross field ball to Darryl Robinson who immediately pushed up the right midfield drawing the Nomads midfield out to cover, a clever jink in, and then accurate release into the Nomads circle found Rob Lee in a perfect position to take the goal and level the score an 3-3. As the game moved into the final 15 minutes, the Dragons defence of Ray Hansell, Rich Davis and Chris Orme moved as one unit to cut out further Nomads attacks. And as the sun came out at a blindingly low level behind the Dragons goal, the match finished in an increasingly familiar way. Full time: Norwich Dragons 6 3-3 Norfolk Nomads 2. The first half ends with only an excellent save from the Dereham Goalie denying Josh Cormack. Even more stout defending by the Dragons up to the final whistle, and a well deserved win, overall the Dragons took their chances well at one end of the pitch and defended resolutely at the other, well done. 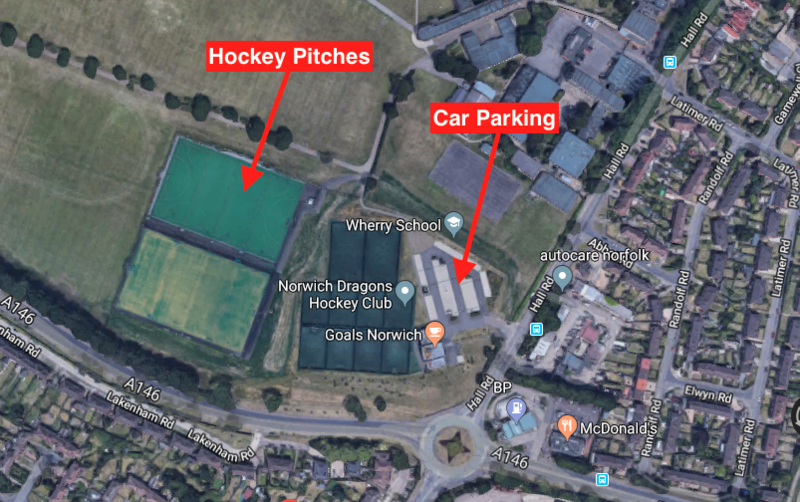 Player’s Report – Today Dragons won 7-0 against Pelicans, with goals scored from Sophie Barrow, Rebecca James, Charlotte Knight, and Niamh Somers, all scoring 1 goal each; and Maddy Reynolds with a hatrick. We started off playing mostly through the middle, but once we’d had a quick chat with Emma, we spread the game out, using the width to our advantage. In the first quarter, we were already 2-0 up, even though there was a strong lady playing in defence. But with some great skills from Maddy, and some brilliant passing between Charlotte Knight and mid-field, we managed to break through the Peli’s defence, and get the ball into the back of the net. Even though Pelicans gained a few breaks, our strong defensive unit, including Tilly Beckett in goal, with some brilliant clears, we fought back and didn’t let one ball in. 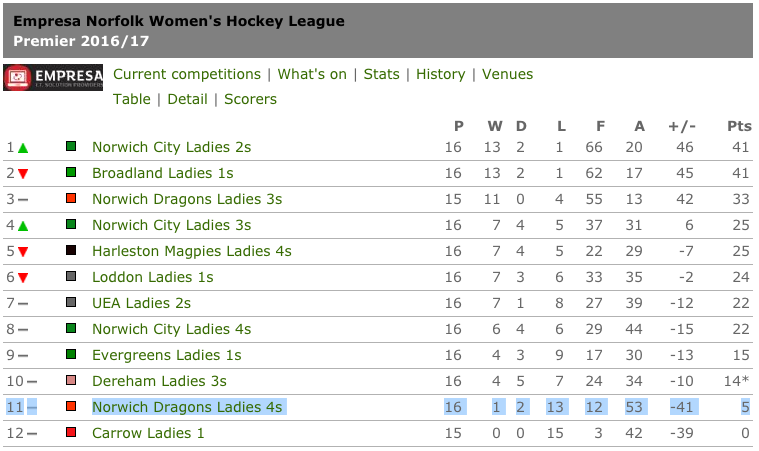 Maddie Gibbs played some great balls out of the Dragon’s 25, and Bethan and Emily Grint also playing very good hockey. I ‘d also like to mention Emily Smith, who made some amazing flat stick tackles. Player of the match went to Sophie Barrow. Today was a brilliant match, and everyone should be so proud of themselves because they each individually have talent, and worked as a team together. I’d also like to say that even though we’re not 1st in the league, we deserve to be! Well done girls!!! There are times in life, where you play a full part in something, only to be a bye-line on the event; a Michael Collins to Neil Armstrong and Buzz Aldrin. 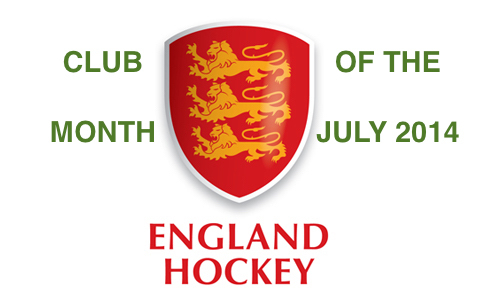 Disappointingly for Norwich Dragons U18s, the outcome of their last-16 England Hockey cup game against City of Peterborough moves their performance on the day, and their cup-run, into this category. It is a cliche that sports is described as preparing young people for life. That being said, there are times when all you can control is what you do, to the best of your ability, and there can be no doubting that the 14 young men who represented Norwich Dragons today met this challenge. Having progressed to the fourth round of the Cup proper, the side were under no illusions of the challenge ahead of them. Peterborough had been encountered in the East Indoor championships, and deservedly won that event. Dragons felt that they hadn’t given a full account of themselves in that game, and that if they performed to their best then they had a chance. The game was played at an intense pace from the off, both sides moved the ball quickly and effectively, with the forwards making good leads and the ball being recycled well. Defences initially had the upper hand, keeping the game compacted into the middle of the pitch. Peterborough struck the key initial blow, their centre-forward was forced wide onto their reverse by an organised defence, only to unleash a fizzing reverse stick strike into the far corner of the goal, leaving Ben Nkrumah little chance. This served to open the game up more. Dragons pushed back and gained some good possession in the final third, whilst Peterborough attacked at pace on the counter. A Peterborough turnover created an overload against the Dragons defence, and a sharp set of passes created space for a clinical finish, again right into the corner. Dragons responded well and had their best spell of the first half, corners were won, one half-saved by the keeper and cleared by post-man, one bringing a good stick save from the keeper. The best chance of all was an open play move that put Ben Watson clean through, a mis-touch deceived the keeper and as Watson went to put the ball into the empty goal, two Peterborough players made last ditch tackles to prevent this. On another day, Dragons might have received more than a long corner, but after a turnover from that corner, Peterborough broke to create another overload for a crucial third goal. To their credit, Dragons kept working, however, Peterborough continued to look dangerous in attack and despite the best efforts of an inspired defence led by Jonty Gosling, added a fourth before the break. Dragons’ half-time team talk reflected on the fact that they deserved more from the game than the current score reflected, and that if the work rate could be maintained, chances would be created. The second half was arguably the best performance this group of players has managed. Dragons came out determined to get back into the game and proceeded to defend to the last and build with great passing and movement to create chances and win corners. Ben Watson duly dispatched a corner with a powerful strike into the corner, and Dragons saw a chance to get into the game. George Bowman, Max Laming, Rohan Kaushal and Raunaq Rai all worked to create opportunities, whilst the skipper Alex Stone led by example, playing through injury to both create chances and provide defensive support. Peterborough responded well, their defence matching Dragons attacking and their keeper standing tall against fine efforts from a number of Dragons players, most notably, Watson, Henry Laming and Charlie Nunn. As Dragons continued to push, Peterborough looked dangerous on the counter. The Dragons defence of Gosling, George Wright & Andy Carver, and the outstanding wing-back pair of Tom Harris and Ed Murphy continued to work to stop this, but Peterborough again proved clinical in attack, taking three well-worked opportunities in the closing part of the game. Overall a result that both reflected the effectiveness of Peterborough’s decision-making in the final third, but that also left Dragons wondering what might have been on another day, especially for those individuals playing their last junior game for the club (as the first male group that Dragons have developed through the junior ranks to U18 level). 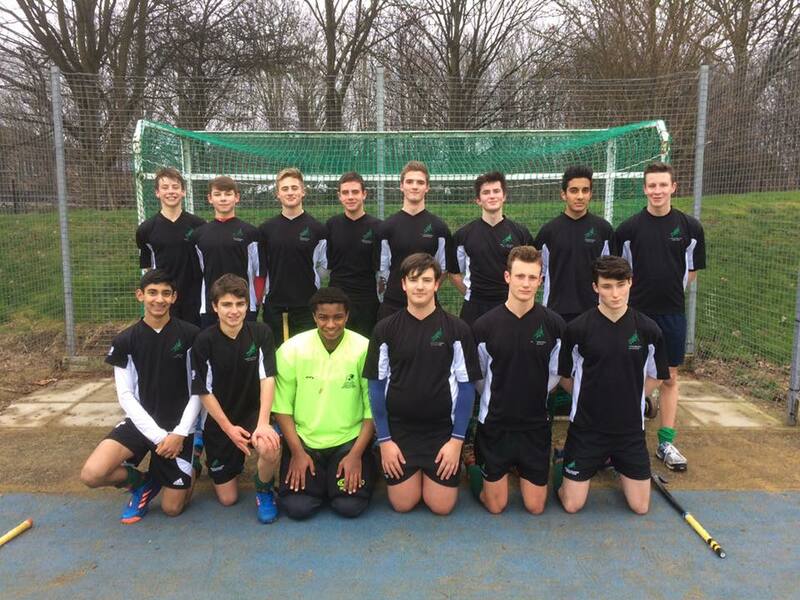 Ben Nkrumah (GK), Tom Harris, Jonty Gosling (VC), Andy Carver, Ed Murphy, Alex Stone (C), Henry Laming, George Bowman, Rohan Kaushal, Ben Watson, Charlie Nunn, Max Laming, Raunaq Rai, George Wright. 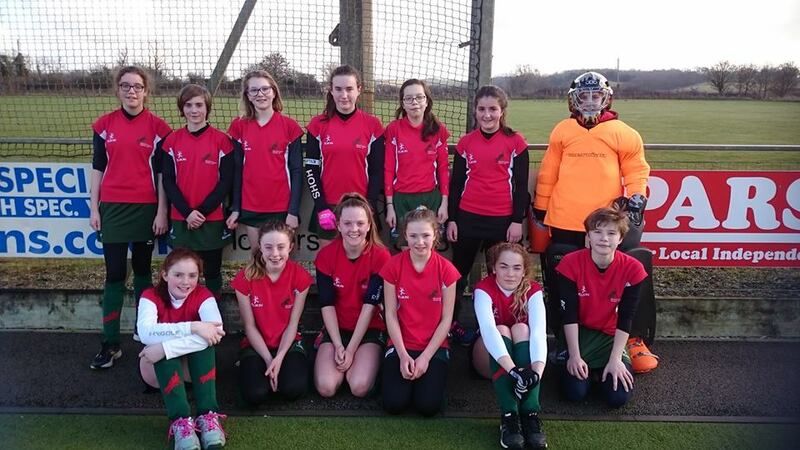 Coach Report – U14 girls lose ten one to Magpies. Very tough game but they battled so hard. Very proud. Goal from Maddy Reynolds. Player of match Sophie Barrow. One game left against city on 26 Feb. Thanks to Emma Somers and Tracy Barrow for sorting the team and sorting various injuries. Player’s Report – We had a tough game this Sunday, with Magpies team being made up of mostly people playing for the ladies team. We started strong, although we conceded a few goals we fought back and an amazing goal was scored by Maddy Reynolds in the middle of the first half, hitting the top of the goal. We carried the second half out with positive minds with a goal almost scored but a brilliant tackle was made by Magpies. Dragons executed a tough games with strong attitudes and we kept the Magpies working hard throughout the game. The ending score was 11-1. Girls U16s fought hard against a strong Magpies side, but lost 4-0. Having conceded a goal within the first 2 minutes, it could have been a lot worse. The girls defended well, and caused the visitors problems at times. It was a good taste of quicker, more intense hockey that we’ll need to aspire to as we improve. The good news is that we are already showing signs of being able to do just that. Player of the match for an extended display of quality defending was Emma Woodhouse. This entry was posted in Latest News on February 5, 2017 by admin.